I love a good split 7" and when you team up two bands like this, well I guarantee you that I'll be picking it up on day 1. 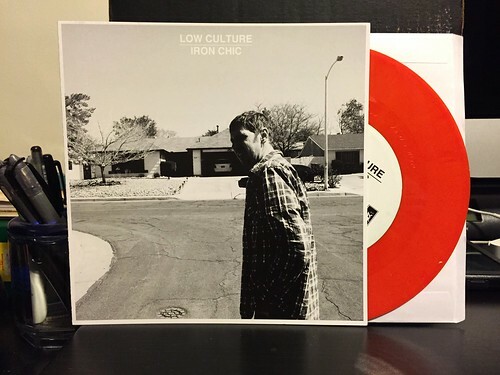 Both Iron Chic and Low Culture have been cranking out fantastic records for a bit and neither one has let me town yet. On this split, rather than have each take a side, both the A side and B side have a song by each band. I'll break it up by band for the sake of the review though. The first of the two Iron Chic songs is "L'espirit de L'escalier." I can't say this is my favorite Iron Chic moment that's come around. It's built around a one hundred mile an hour galloping drum beat, the exact drum beat that tends to drive me crazy whenever any band uses it. There's a few nice breakdowns, but in general I think the song is just so fast it ends up being a little one dimensional. That being said, their second contribution "Subhumanoid Meltdown" is incredible and showcases everything I love about this band. The tempo is slowed down and the band really hits it's stride with a huge chorus that begs you to scream along with it at the top of your lungs. Low Culture is just so damn great. Their two songs on this 7" could be some of their best to date. I really hope these guys are working on a new full length very soon. Their first song "Not A Machine" is a punchy blast of garage-y guitar and pop hooks. Just outstanding. Somehow, their second track "Oh Jazelle" is even better. A little slower, but even catchier than "Not A Machine." I think Low Culture is an hugely underrated band, everything they've touched has been absolute gold since they started up. If you don't have any of their records in your collection, this split is a pretty great place to start.